Previous PostParent’s Parents, iiNext PostEvidence of a Life Well Lived, or Debauchery..
backup your database! NOW. then redesign. tek. i don’t know how!? where’s my database? my site is powered by wordpress on a yahoo! platform! Has it only been two years? At the same time: It’s been two years all ready? Where does the time go? I realized I’ve had the same set of not-resolutions (i.e., things to think about doing differently) for the last four or five years, and not it looks like I’ve accomplished them. They were about getting my money sitch together, taking better care of my body, and getting my social life in order. So now I need to come up with something else. My resolutions will probably be focusing on the same things, just with different specifics. I’ve been meaning to blog about it all, but I haven’t seemed to find the time when my brain is on it or find the focus when I have the time. It’s forthcoming, I swear! I think making resolutions is setting yourself up for failure. Something about the word “resolutions” is off-putting. Resolutions are made to be broken. Maybe we should all think of it in terms of setting goals for ourselves for the year. It’ll force us to frame them in a more concrete and achievable way. Of course the goals should be in line with the vision we have for ourselves. Because we all have a vision, right? 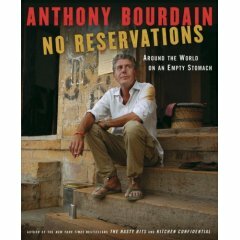 OK, I love Anthony Bourdain. I met him last year at a book signing and he was so cool! I got to tell him that he was part of the reason I dropped by Vietnam when I was in SE Asia. He was genuine and funny. I really need to pick up that new book. My resolution is to run the Chicago marathon, which will mean a summer of early mornings and torture. And to get better at saving money for MORE TRAVEL! I would have to agree with you about the “anti-resolution” sentiment. I didn’t make a list of resolutions for 2008, however, I did say that I would like to be more social and make it my business to go out in the world at least once a week aside from going to work, running errands, and hanging out with familiar friends. I need to branch out and become more “open” as friends have advised me in the past. This is directly in sync with my desire to have a more active dating life. So will be stepping out of my comfort zone in that area myself. I think there have been some old hang-ups that I need to clear out of my closet surrounding my physical appearance, flirting, physical attraction, and the like. Bottom line I am to be more of an active participant than a passive observer. All in all I expect and will have a marvelous 2008 . . . I wouldn’t accept anything less. That does it…I’m gettin’ that book. We LOVE his show. Which just reminded me that I slept through tonight’s ep… I gave up resolutions about the time I stopped wearing legwarmers…’cause they did me about as much good. But since the bloggity tribe is all about theme words these days, I chose as mine this year LEAP! (And yes, I must type it all in caps and add the excl. point or I might not do it.) Happy Blogiversary. Looking forward to seeing what this next year will bring you. Wow. You calculated 34.8! You rock. I love it. I can’t offer fried chicken or shots – but we can do Outback when you get to Hampton. I am trying not to “sweat the small stuff” though! yahoo should have some instructions on that. or you can email me offline if you don’t have someone closer to assist you. I love visiting your site so I want to know it’s protected. geeky i know to care about the internets backups.